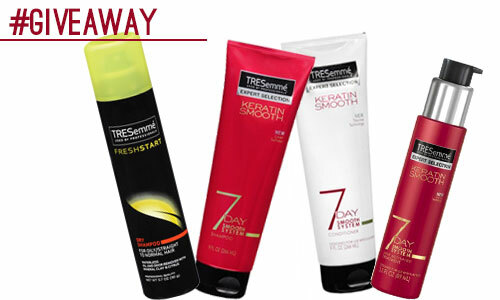 We are giving away the new Keratin Smooth Collection from TRESemme to help maximize your blowouts for Two-Day-Hair-Perfection. This includes Keratin Smooth Shampoo, Keratin Smooth Conditioner, Heat Activated Treatment, and (bonus) new Fresh Start Dry Shampoo, valued at $21.96. Read below for instructions to enter. Good luck! 2. Leave a DISQUIS comment below [click through if you are reading this post in your Tumblr feed] and tell me your secret for beautiful two day hair. NOTE: Please don’t comment in the ‘Ask Me Anything’ or ‘Fan Note’ area of Tumblr. If you do we will not see your comment and not be able to enter you into the contest! — Please everyone click through and leave a comment on Cult of Pretty itself. Contest ends next Friday March 7th at 11:59PM. NOTE: If you subscribe or follow to enter, you must still be subscribed or following at the time of the drawing to win. Multiple comments do not increase your chances of winning.